From the Cumberland Gap to the Atlantic Ocean, this is Virginia Water Radio for the week of February 24, 2014. This week, we feature a popular traditional tune whose name may come from a southwestern Virginia stream. Have a listen for about 40 seconds. Goin’ up Cripple Creek: February 22, 2014, view looking upstream near the creek’s confluence with the New River in Wythe County, Virginia. Goin’ down Cripple Creek: July 22, 2013, view looking downstream between Cedar Springs and Speedwell in Wythe County, Virginia. Photo courtesy of Patrick Lizon, Virginia Department of Environmental Quality. 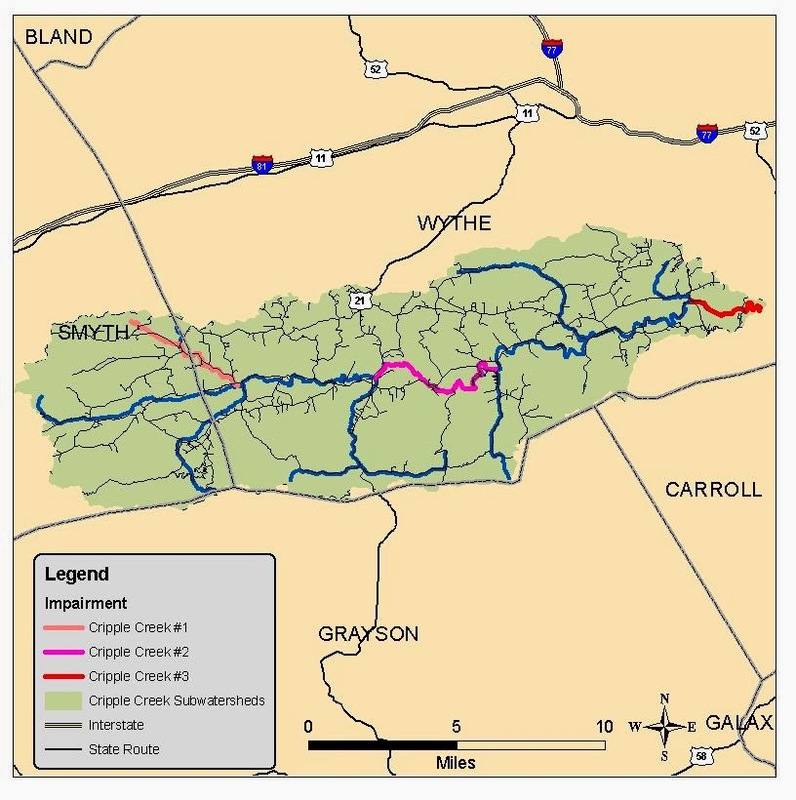 Cripple Creek watershed in Grayson, Smyth, and Wythe counties in Virginia, with colors showing impaired, segments of the watershed, that is, segments that do not meet water-quality standards. From Virginia Department of Environmental Quality, “Bacteria Total Maximum Daily Load (TMDL) Development for Cripple Creek,” October 2009, page 27. Acknowledgments: This week’s music was recorded for Virginia Water Radio on February 11, 2014, by Stewart Scales; used with permission. More information about Mr. Scales and the group New Standard, with which Mr. Scales plays, is available online at http://newstandardbluegrass.com. Information on the tune “Cripple Creek” was taken from “The Traditional Tune Archive,” formerly known as “The Fiddler’s Companion,” by Andrew Kuntz and Valerio Pelliccioni, online at http://www.tunearch.org/wiki/TTA. The “Cripple Creek” entry is at http://www.tunearch.org/wiki/Cripple_Creek. Information on Virginia’s Cripple Creek, including the map above, was taken from the Virginia Department of Environmental Quality report, “Bacteria Total Maximum Daily Load (TMDL) Development for Cripple Creek,” October 2009, accessed online at http://www.deq.virginia.gov/portals/0/DEQ/Water/TMDL/apptmdls/newrvr/crippleec.pdf; and from the Virginia Regulatory Town Hall notice about the February 11, 2014, meeting on the TMDL Improvement Plan for Cripple Creek, online at http://townhall.virginia.gov/L/Viewmeeting.cfm?meetingid=21141.